It began for me in Maryborough in Queensland. My Dad played violin, and saxophone, my mother piano and violin. Both were in the local orchestra. My mother was a piano and singing teacher. For some inexplicable reason, although I had a great voice and a willingness to learn, she refused to teach me. I can only put it down to the fact that she suffered depression and had cut off from all her music performances by the time I was a small child. What I did not understand is that she also refused to allow the other singing teacher in town to teach me even though it was offered free of charge. My puzzlement over this led me to grow up thinking I was not good enough musically. I often wonder what might have happened had I been encouraged to sing and play music. I fantasise that my life may have taken a musical path much sooner. Who knows - I could have been famous!!! For years I only sang for friends and though they told me I had a fantastic voice, I think my experiences as a child held me back. My first husband bought me a guitar when I was 21 and that could have been the beginning, but I still lacked that belief in myself and the guitar sadly gathered dust. I moved to Brisbane in the 70’s and I began to haunt the folk scene. Music was in my soul but no one knew back then that I could sing. I was just a shy spectator. I went to the first Maleny/Woodford festivals and was hooked. I have attended ALL of them except two when I was traveling. Now that’s a folkie claim to fame! Travel with my environmental job as Director of Tidy Towns took me out of the music scene for a number of years. Losing my baby was a major turning point and the subsequent grief made it difficult to work so I resigned that job in 1996. I needed the healing power of music so made a decision to attend the inaugural Summersong Music Camp in 1999. That was the turning point as I discovered I had a talent for songwriting. My first song - the famous “Teeth” - a true story about my false teeth falling out at a singles date - was born there. I would not be where I am today without Kristina Olsen. She believed in me and was so impressed with my “Teeth” song that she insisted I perform it at her next Brisbane concert. At last I had found someone who believed in me enough to encourage me and give me a gentle push. That was all I needed. The audience response was wonderful. I was on my way. The rest is history. I began to write songs. At first it was comedy songs as I needed laughter in my life, then more serious ones. I was elated when I won Top Five in Music Oz Awards in 2006 for one of my songs, receiving my prize at a dazzling Sydney awards ceremony. Two years later I reached Top Eight in Australian Songwriting Awards and the next year Top Ten. I write from my heart about people who have touched my life and in my current profession as a counselor I am often inspired to write from the stories I hear. I was fortunate to find people who believed in me such as Andrew Pattison of Troubadour fame. I knew that he gave new performers a chance. Both Kristina Olsen and Martin Pearson told him I was worth listening to so in 2002 I had my first Troubadour gig on stage at Woodford Folk Festival. I knew that unless I got a good audience response, I would never get another chance as Andrew had a reputation for only giving spots to really good performers. The audience loved me and so it appeared did Andrew, as he invited me to perform on his stage at every Woodford Festival after that, and every National Festival, until sadly the powers that be decided Andrew’s Troubadour was no longer to be part of either festival. Woodford and the National were not the only Festivals I performed at. Yungaburra, Palm Creek (three years in a row), Neurum Creek as well as support act for Enda Kenny and Pete Moreton were highlights. I am very excited to be gracing the Neurum Creek stage again this year. I have had an array of great guitarists over the years - Mathew Moline, Steve Weir, Rob Stewart, and the wonderful Chris Jack (also of Murphys Pigs) has been my duo partner for the last seven years. We make a great team. We produced my first album in 2006 and I have sold about 600 - pretty good effort! While the folkie scene is my love and where my heart and some great friendships lie, I have also found some exciting challenges in more mainstream music. I entered Senior Superstar Competition in 2012 and beat over 3000 contestants to win second place. The highlight was performing on the QPAC Concert Hall stage to an enthusiastic audience of over 2000. There is nothing like thunderous applause from so many people. In 2013 I was selected from several hundred as one of the Top Ten to perform at the Lord Mayors Gala Concert in the City Hall. What made it an absolute highlight was that Debra Byrne (of Young Talent Time fame) did harmonies on my song. I performed “The Rose” with her, accompanied by a seven piece orchestra, to an appreciative capacity audience of 1800 – and standing ovations!. So now what! Some of those experiences are hard to top. I continue to sing and perform and get just as much enjoyment doing so in a folk club as opposed to the QPAC stage. (less stressful at least). I know I will continue to make music a big part of my life as long as my voice and body lets me. After all music saved my life in so many ways and the friendships with folkies have brought a richness. 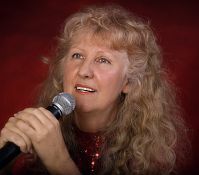 So check out my website www.glenysanderson.com.au and invite me to sing. I LOVE it.